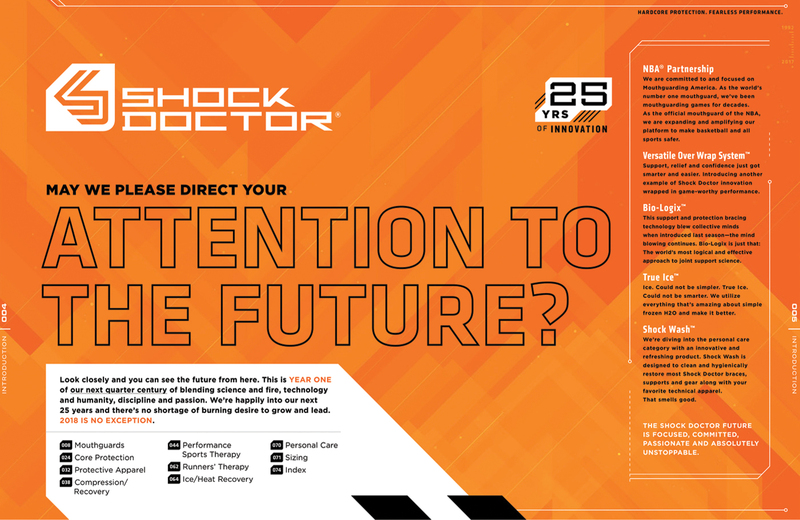 Shock Doctor - Sussner Design Co. 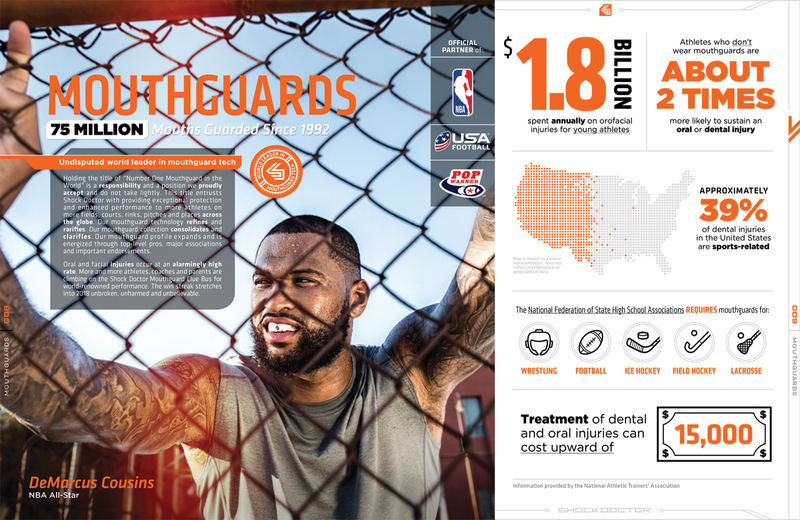 In addition to being the number one mouthguard in the world, the Shock Doctor brand has built on its strong foundation to become a full-on athlete protection and performance machine. 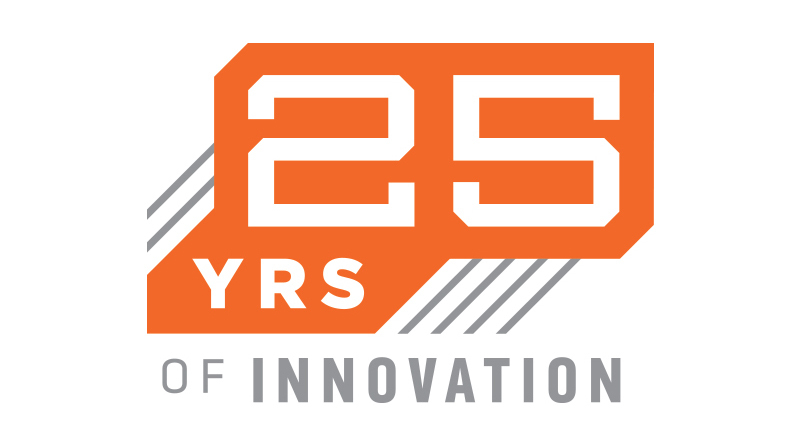 Their 25 years of product innovation has put them head, shoulders and ankles above their competitors. 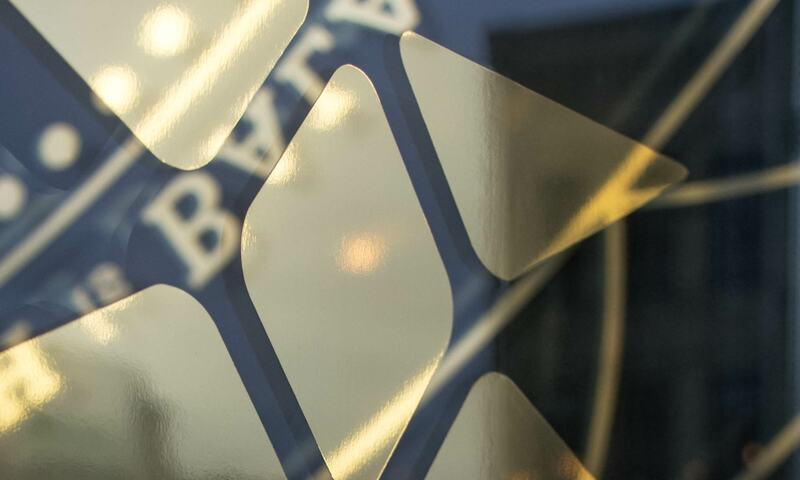 They came to us seeking to improve their connection to and engagement with their customer. 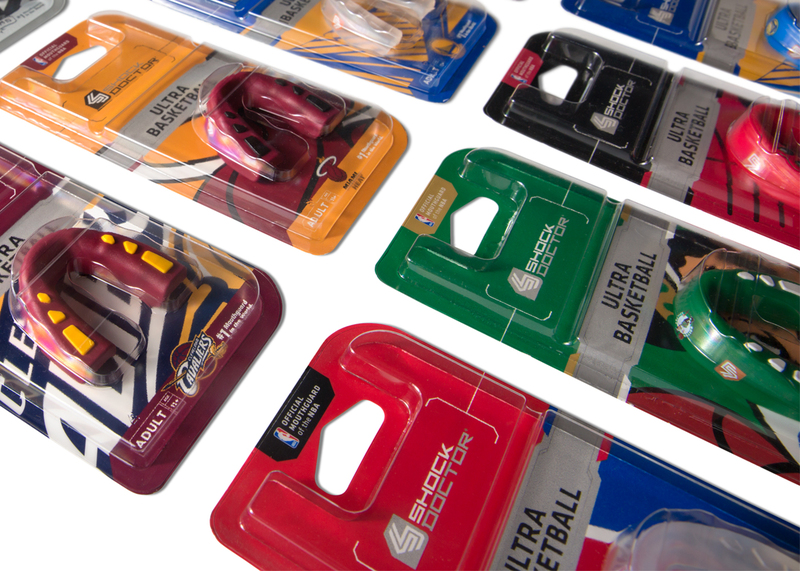 Helping shoppers choose the right product for them was objective number one. 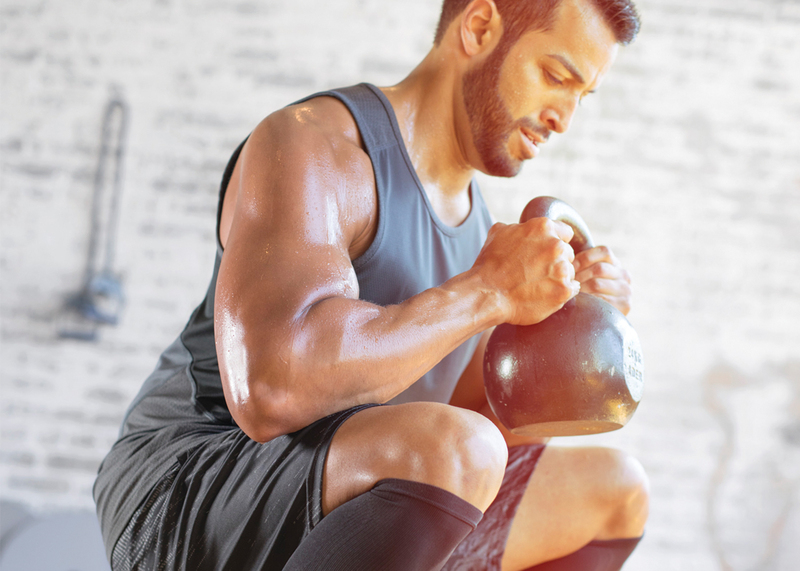 Through new lifestyle photography, a refined brand voice, fine-tuned product packaging and retail merchandising, we helped reinforce Shock Doctor's brand recognition and credibility among athletes. 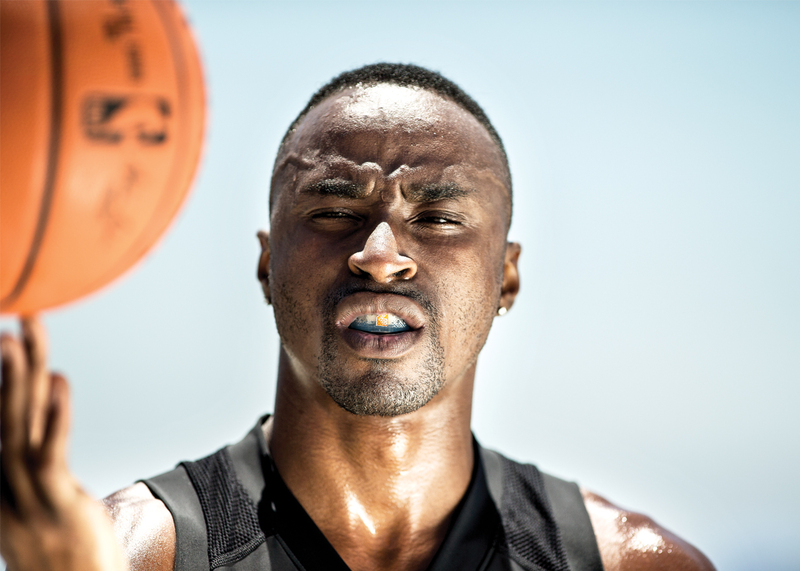 Shock Doctor is the reigning champ of mouthguards and their dozens of models speak to that. 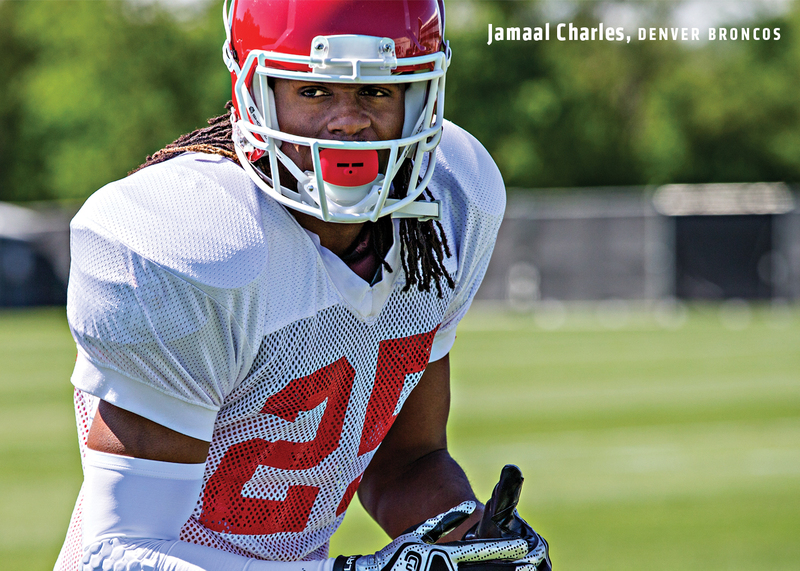 From the outset, the goal was to improve upon their greatness—specifically their shop-ability at retail. 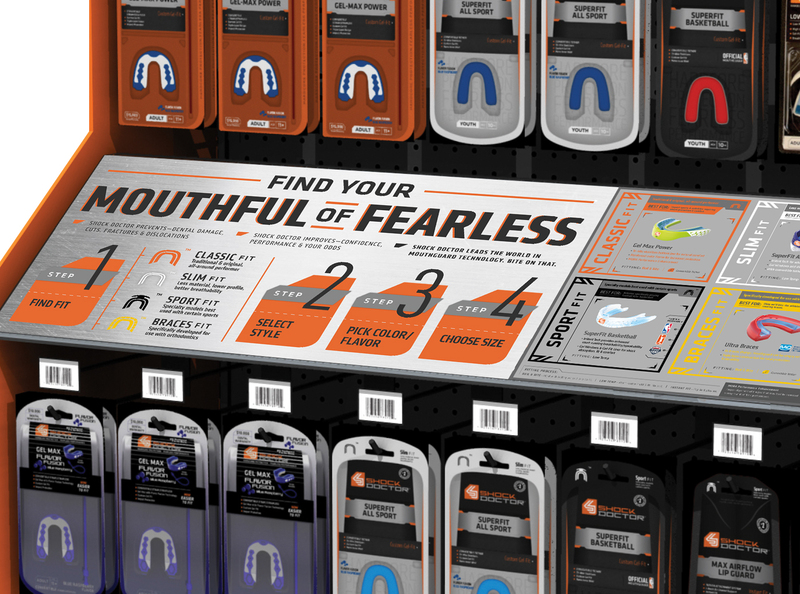 Creating a communication system for the packaging and signage fixtures was a clear way to elevate the mouthguard game. 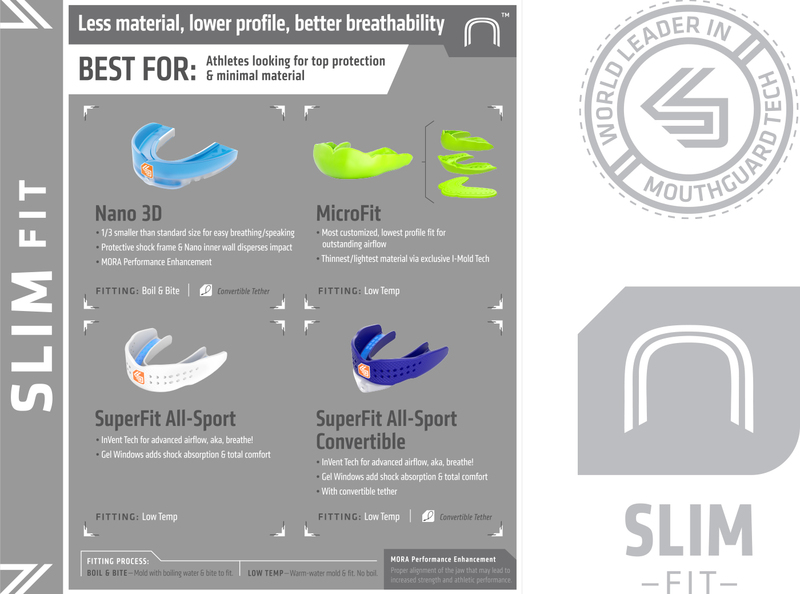 The new FIT system was rooted in a classification for all mouthguards based on their intended use, unifying groups of product through icons, color and placement on the retail shelf. 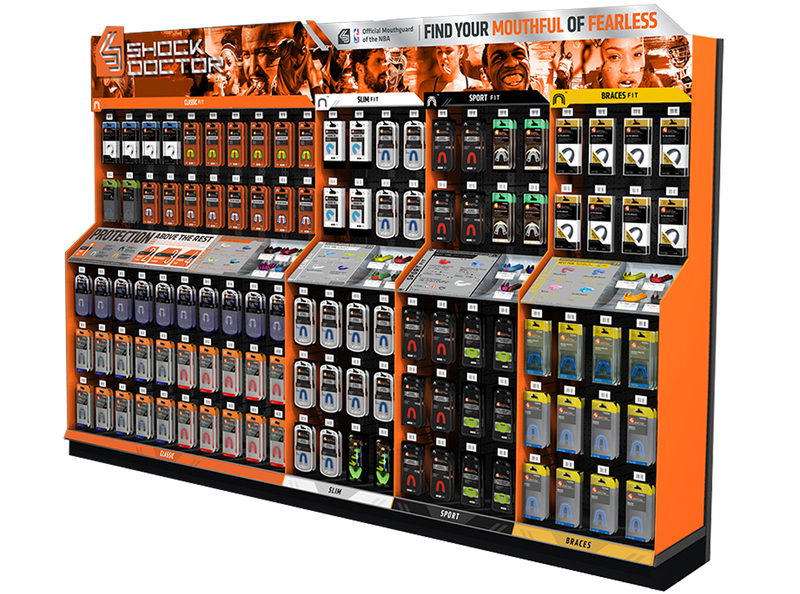 MERCH WALL: The new display is highly categorized, organized and branded which gave Shock Doctor a strong presence in the store. 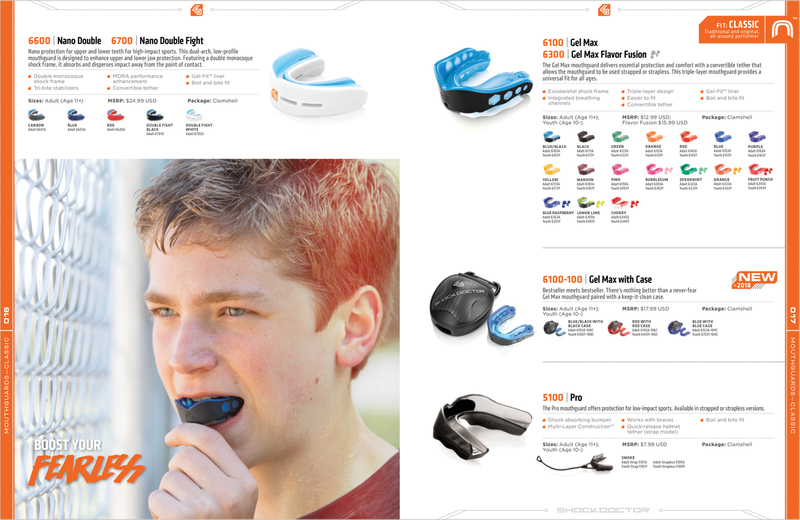 PROTECTION SELECTION: A four step guide helps customers find the right fit, style, flavor and size. 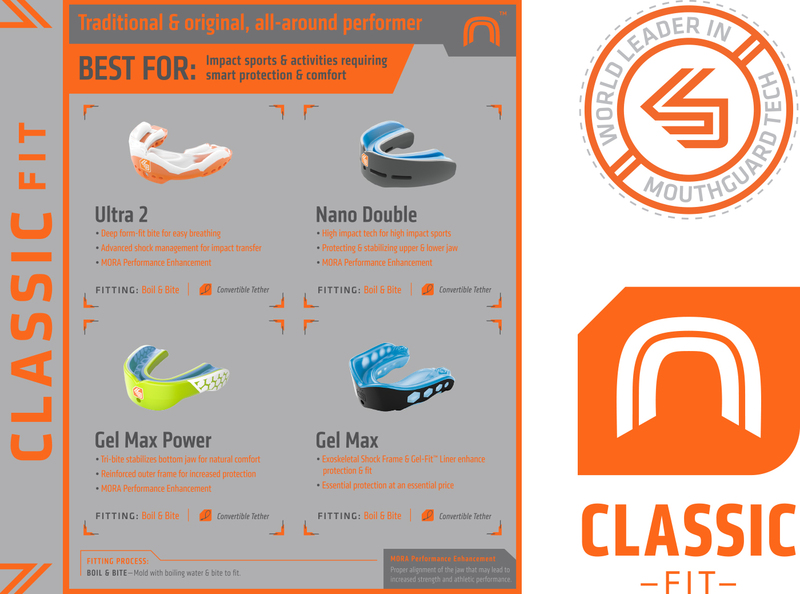 CLASSIC POD: Each FIT category has a descriptor pod that explains the different MG styles and their specific uses. 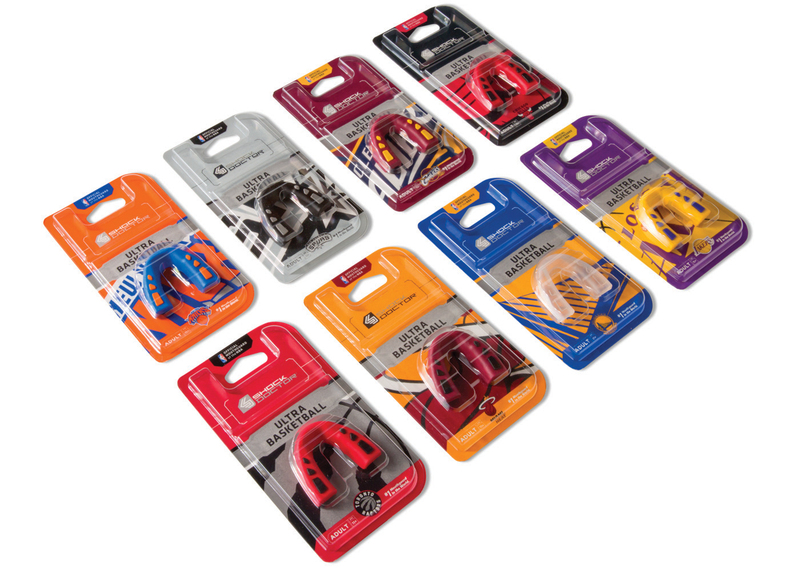 SLIM POD: Each FIT category has a descriptor pod that explains the different MG styles and their specific uses. 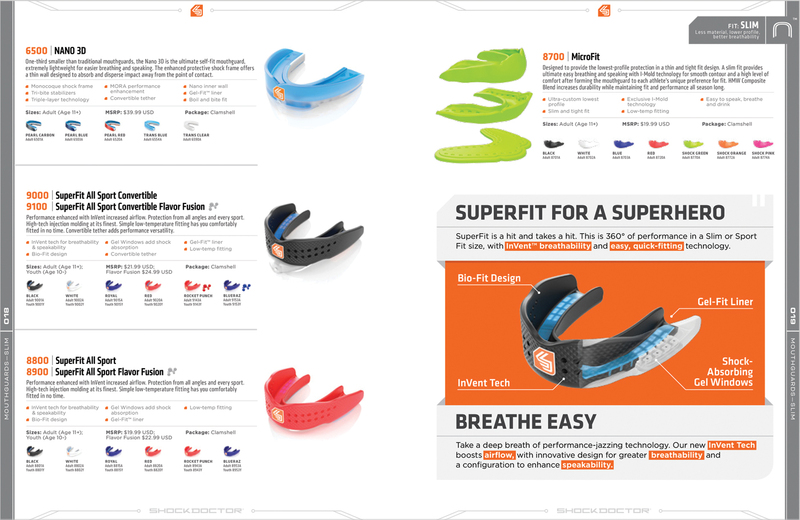 SPORT POD: Each FIT category has a descriptor pod that explains the different MG styles and their specific uses. 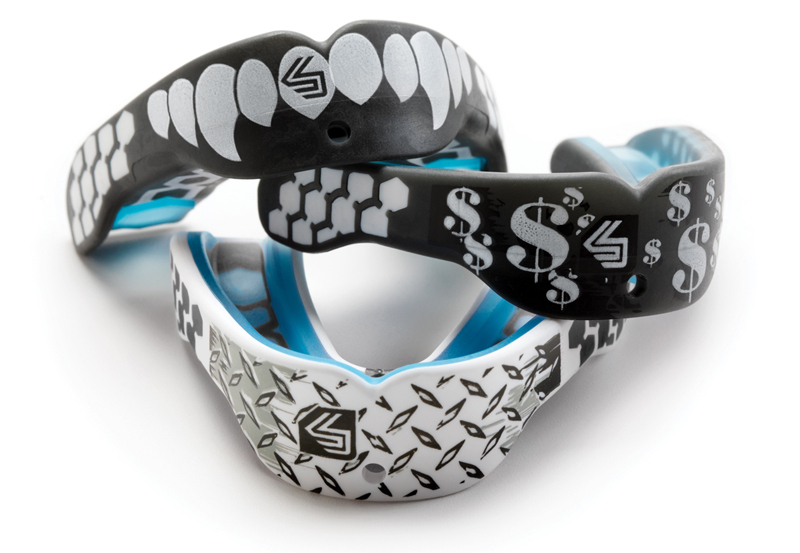 BRACES POD: Each FIT category has a descriptor pod that explains the different MG styles and their specific uses. 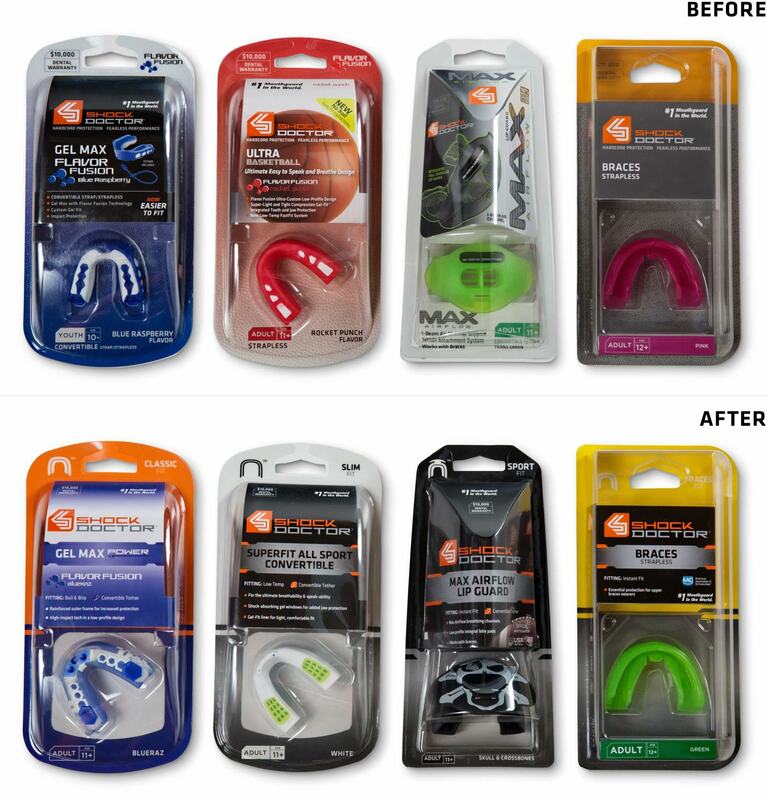 To support the new merchandising strategy, the existing packaging for the mouthguard products was redesigned to integrate with the four newly defined FIT categories. 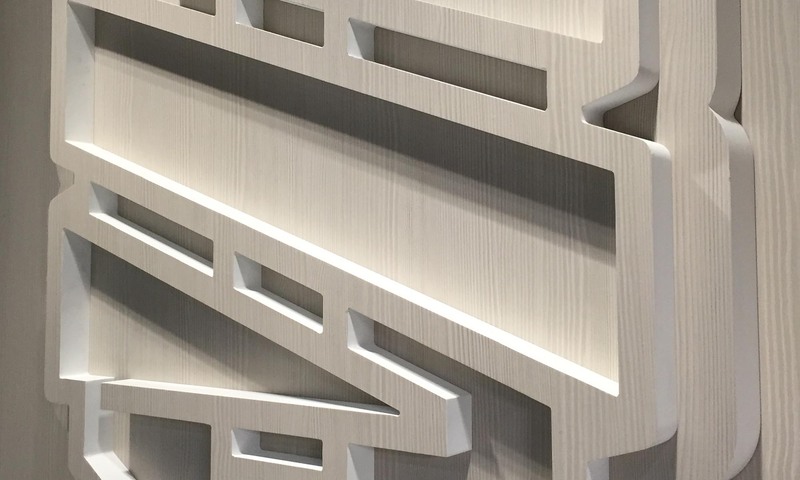 The new design was applied across the family of existing container structures, with a solution that simplified and unified each product’s features and benefits, including product style, color, flavor and size—and logos for endorsements and licensed partnerships. 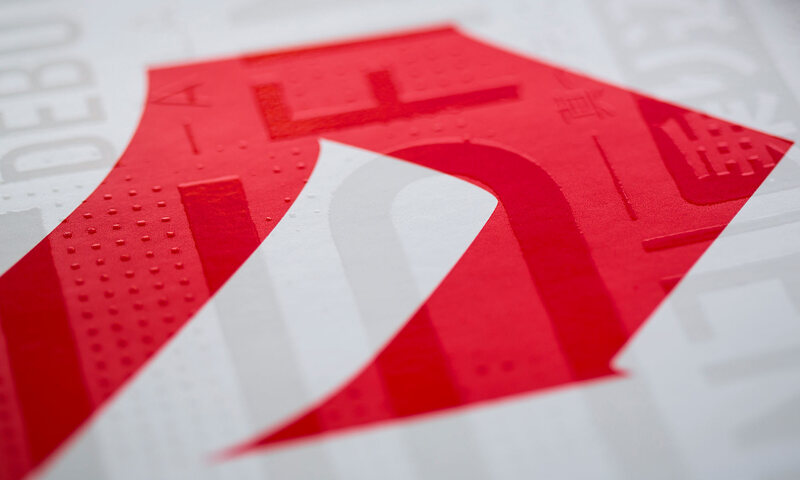 PACKAGE UPDATE: Refreshed product packaging with the new FIT system icons and colors, and a refined brand template designed to integrate with existing containers. 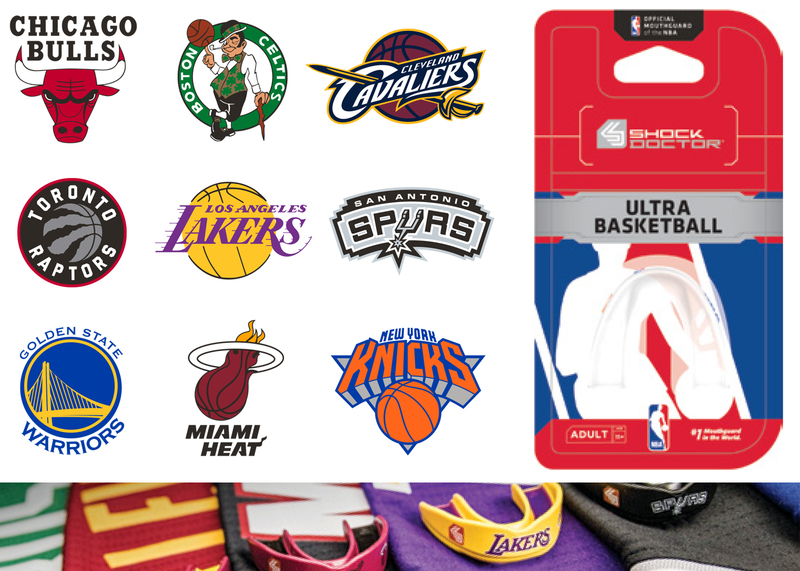 When Shock Doctor became the Official Mouthguard of the NBA, SDCo designed new packaging for each team logo’d mouthguard. 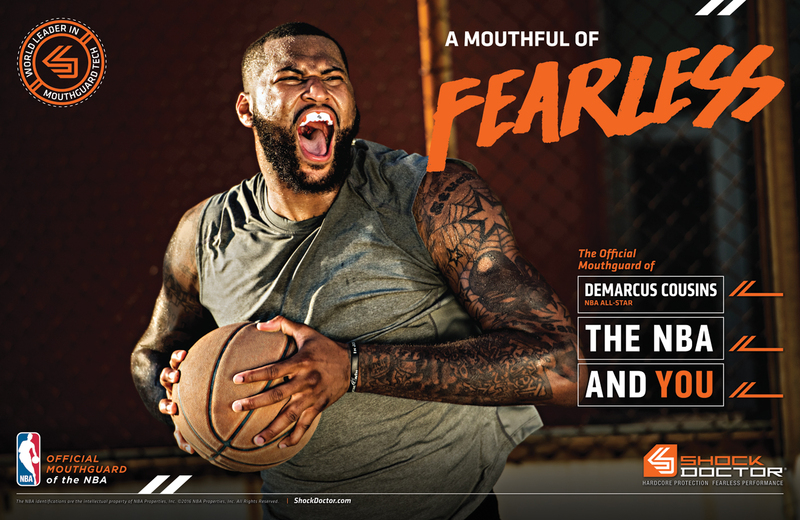 The series leveraged Shock Doctor’s NBA partnership, while continuing to support the activation of their professional athlete ambassadors: Kevin Love, DeMarcus Cousins and Harrison Barnes. 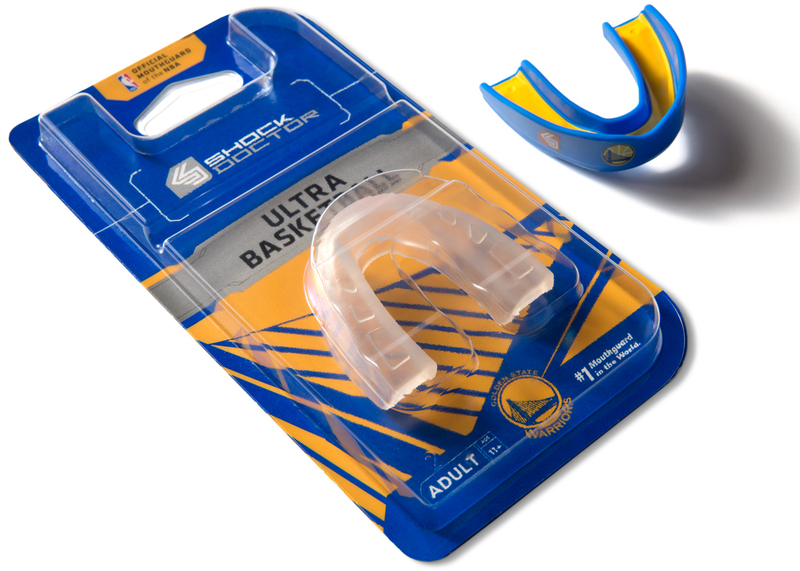 NBA MOUTHGUARDS: Now fans can show their colors front and center with the world's number one mouthguard showcasing their favorite NBA team. 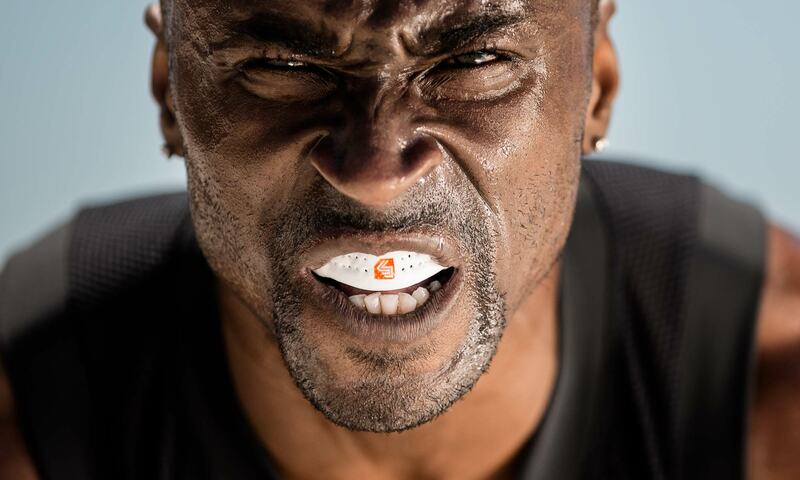 Shock Doctor needed an updated look for the brand photography that spoke to athletes in an emotional way. 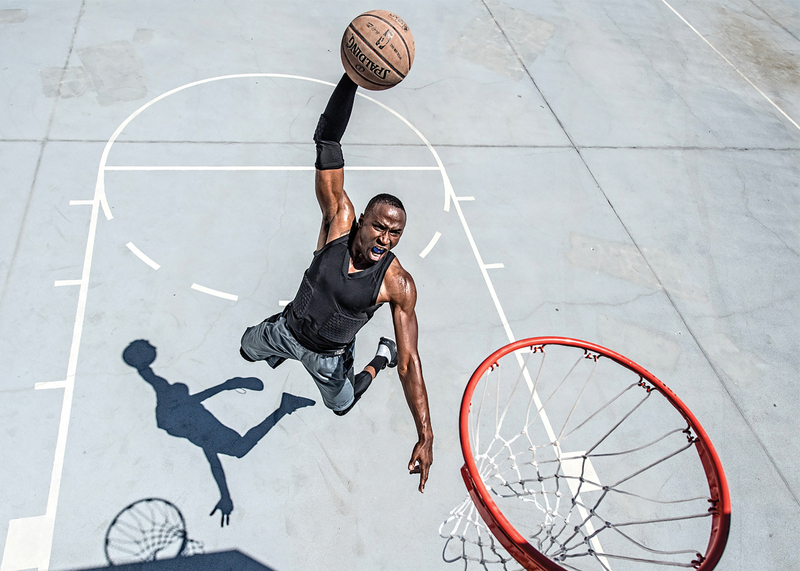 By demonstrating an attitude of confidence through warm, natural and authentic lifestyle photography, the brand became more relatable and dependable. 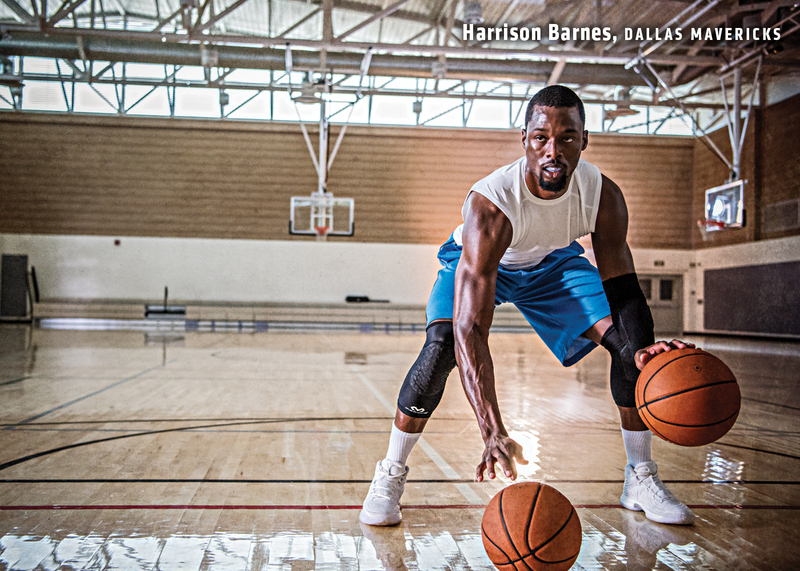 Merging the technical and athletic background of the company with a performance-driven approach reinforced the genuine experience of their personality. 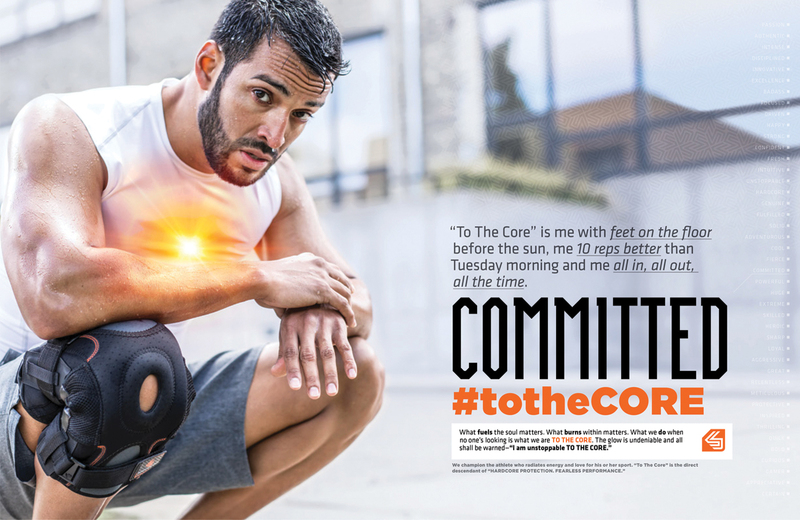 AD CAMPAIGN: “To The Core” is me beating the 5:15-wake-up-call. 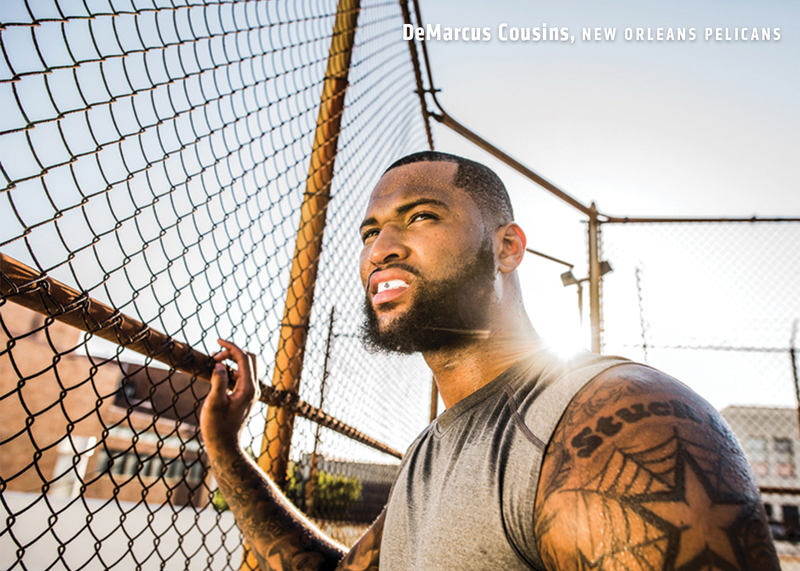 “To The Core” is me 10-reps-better than Tuesday. 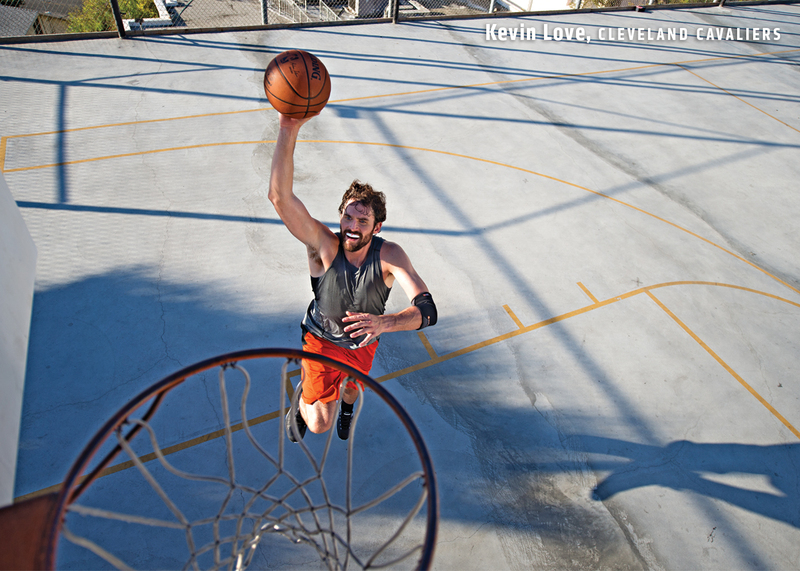 “To The Core” is me all-in, all-out, all-the-time. 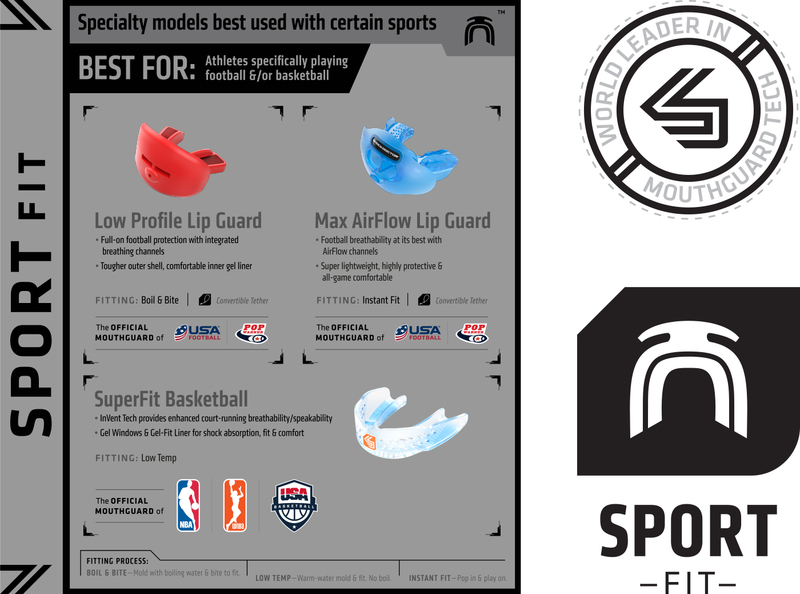 AD CAMPAIGN: Basketball-specific mouthguard campaign to help promote partnership with the NBA. 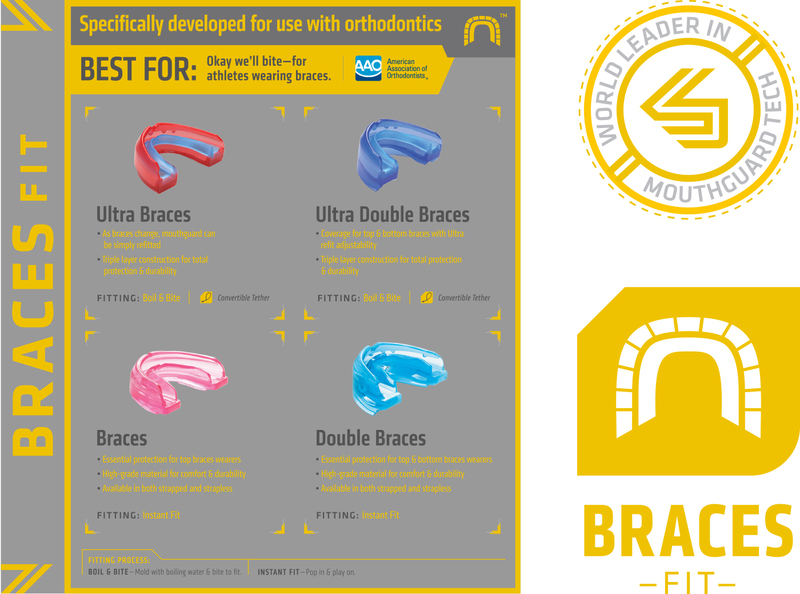 ANNUAL CATALOG: The trade catalog is a presentation of key information, statistics and technologies demonstrate Shock Doctor’s leadership in technology, quality and innovation.